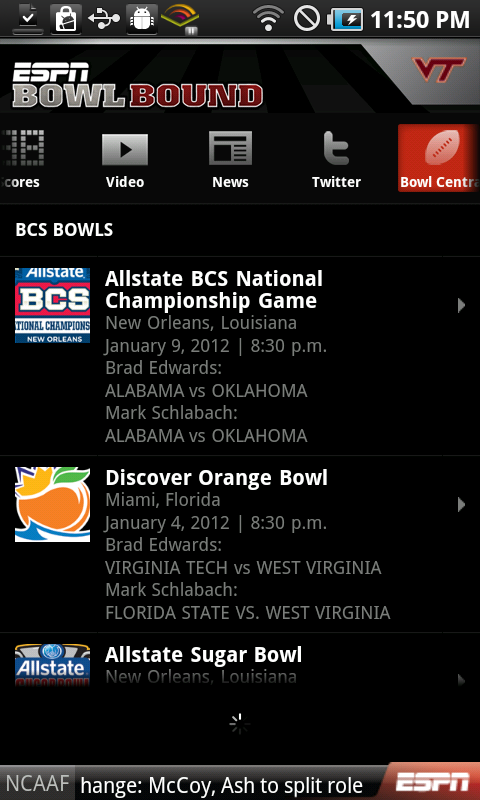 We’re two weeks into the 2011 college football season now, which has given me ample time to use ESPN’s Bowl Bound app. 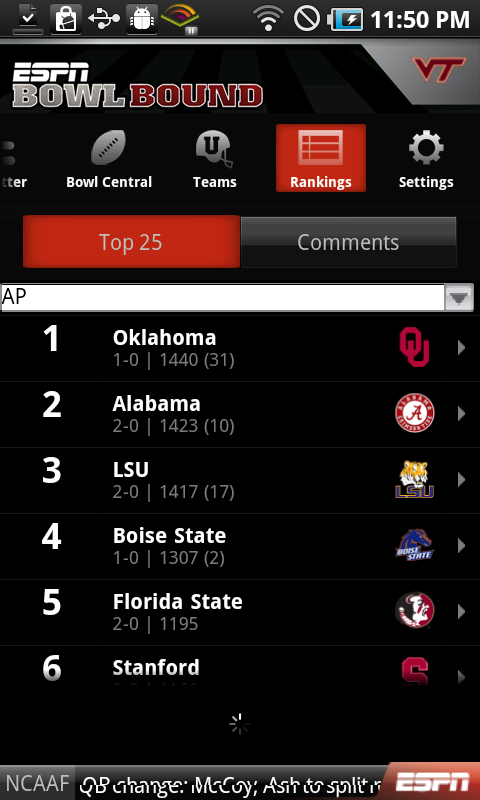 My conclusion: If you’re a college football fan in the least bit, you need to get this app. It’s well done, easy to navigate and provides exactly the information you’re going to want to have available on-the-go about college football. The app provides you with nine main tabs, which always remain on top. A good choice for simple navigation. Here are the tabs in order from left to right. Home is first, which displays the top stories in college football, the most significant getting a front and center photo. Scores show you past and current scores around the NCAA. By default, the scoreboard is set to the Top 25, but you can narrow it down by division or see the entire field if you want to. 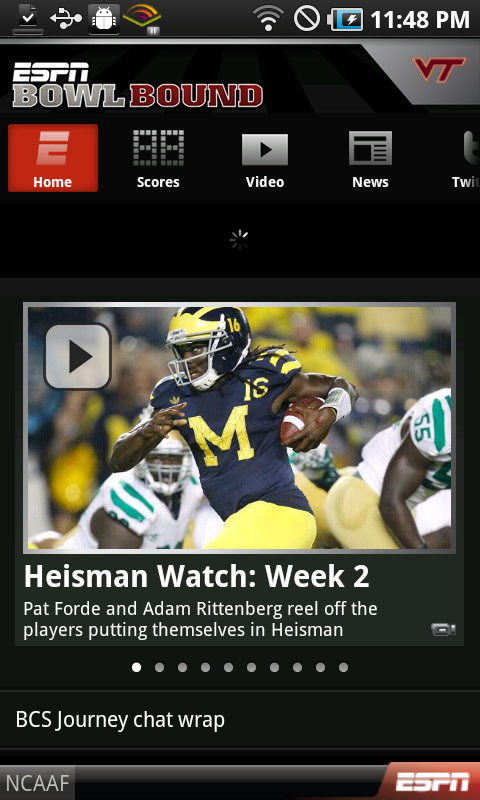 Video lets you have access to a variety of ESPN clips related to college football. Video is divided into three categories: analysis, highlights and exclusive. The Analysis section gives you videos of college football experts opining about subjects such as who will win the BCS title.The Highlights section provides video highlights of the most recent games and is handy if you missed any of the action that week. The Exclusive section has videos that are exclusive to the Bowl Bound app, such as a behind the scenes on the GameDay bus with Erin Andrews. Bowl Central, much like it sounds, gives you the current bowl projections as determined by ESPN. Obviously these will change quite a bit during the season, so it’s great to have easy access to them wherever you are. Twitter aggregates all college football related ESPN tweets. 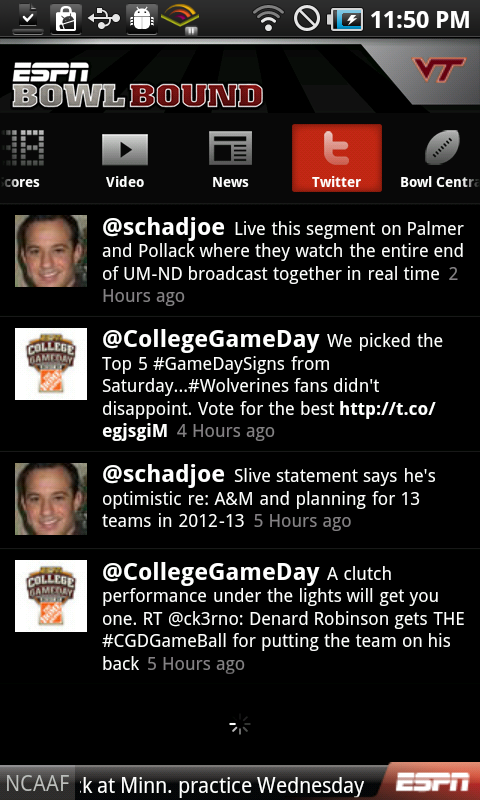 It essentially gives you a Twitter list for ESPN college football. News, much like Video, has three sub tabs: News, Columns and Blogs. 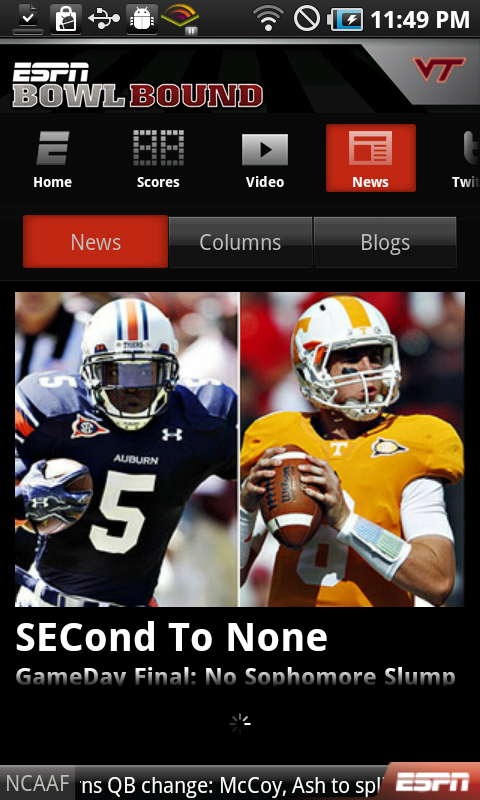 News gives you the most up-to-date news headlines regarding college football. Columns lists all the latest writings by ESPN columnists (some of which require ESPN Insider). Blogs allows you to narrow the view down to conference. There is a blog for each conference, so you’ll have easy access to everything from this tab. Teams provides everything you want to know about a specific college football program. Once you select a team, you’ll have access to it’s clubhouse (team-specific news), roster, schedule, videos and photos from recent games, Twitter and a discussion so that you can talk to others about how your favorite team is doing throughout the year. Rankings, like Bowl Central, gives you the latest Top 25 and also allow you to comment on them as to whether you agree or disagree. Settings gives you the opportunity to sign in or out of your ESPN account, change your preferred team and send feedback to the developers. 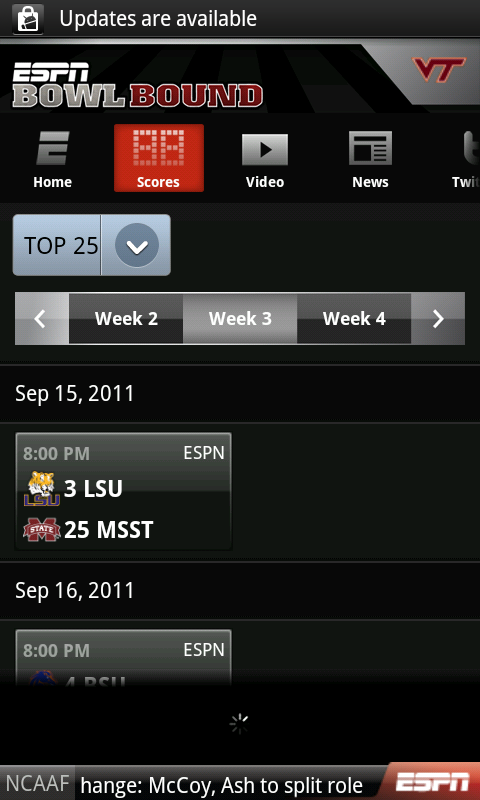 ESPN has released quite a few apps and they have been hit or miss. This one is definitely a hit and one of their best to date, especially if you’re a college football fan. If you're interested in this free app from the Android Market, please find links after the break as well as more screenshots. If you have questions or comments about the app, hit up our Forums and speak up!